Jump To096: "Chewie, get your toe outa my ear! "097: "Who's the more foolish? "098: "Why aren't you at your post? "099: Chewie Thwacks the Gantry Officer100: Chalk-up one dead Gantry Officer101: Hong Kong Chewie!102: "He keeps on saying, 'she's here'"103: "Princess? I'm not going anywhere! "104: "We have to rescue her! "105: "She's rich..."106: "Where are you taking this... thing? "107: "Look out—it's loose! "108: "You'll make a space pirate yet! "109: "Uh... slight weapons malfunction"110: "It was a boring conversation anyway..."111: Searching for Cell 2187112: "Aren't you a little short for a stormtrooper? "113: Still a little short for a Stormtrooper114: "You're more beautiful than I thought! "115: "Luke Skywalker—I'm here to rescue you! "116: "You've cut-off our only escape route! "117: "Solo, how do we get out of here? "118: "Solo! "119: "I knew it... Obi Wan is here!" 1978 | age 9/10? A fairly daft page today readers! But that’s good, right? “ACTION STATIONS!” scream the 1970’s Tannoy Speakers. “But you killed him?” asks Tarkin, leaning on his kitchen table. “Oh” is Tarkin’s punchy climactic retort. 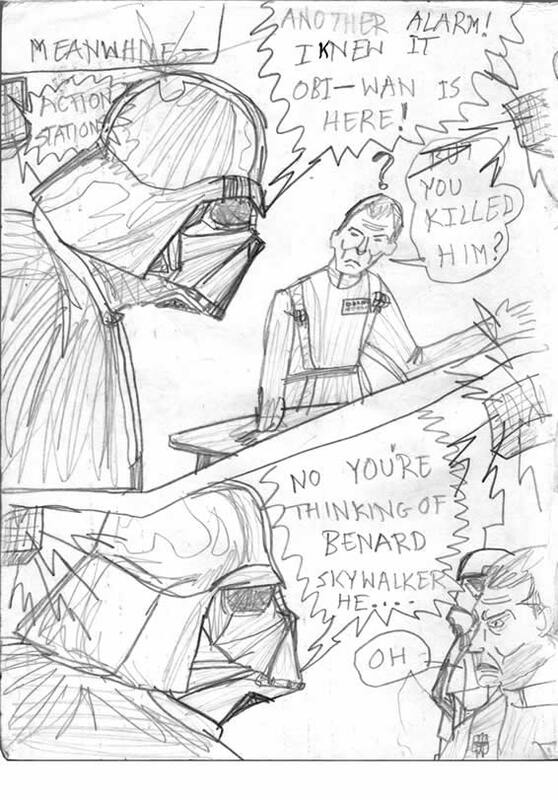 Who the hell is Bernard… oh excuse me, I’m sorry: BENARD Skywalker? Click here to not find out! Come on, we all know that George originally had no intention for Vader to be Luke’s father. It’s right here on paper. From the pencils of babes eh? Did I think Ben was a contraction of Bernard/Benard? That brings up all sorts of awkward questions! This is a bit like those Moment-to-Moment comic panel transitions that Scott McCleod discusses in Understanding Comics. Hardly anything happens at all—visually. Vader is pretty much replicated in both panels—pointlessly. And Tarkin moves around closer to Vader to utter a weak “Oh” at the end of the exchange. Usually in these transitions you need a pretty strong text accompaniment—whether long or short—to convey some big idea which is occupying this short snapshot in time. Or even some sort of expression on the part of the actor. In Vader’s case, of course we don’t get it. Art Notes: Pencils. Well, la-dee-dah! I think this is the only page in the whole comic drawn in pencil. I don’t know why it was done in pencil. Pure necessity? Or had I seen the pencil artwork in Incredible Hulk Monthly with all its unusual tonal effects? It’s also possible that my sister had brought home some pencil studies from her secondary school art class and I’d been impressed (I never had any art classes until I was about 15 or 16). That was when I first saw the evil technique of pencil-smudging. My Art College tutors would scold me for that, years later. Tarkin’s arm has been so poorly attempted that I think I wasn’t that interested in drawing this scene. No blasting, no explosions, nothing! I stuck in a stormtrooper though to keep myself awake.